The financial services marketplace is growing increasingly competitive, with a wealth of independent fintech start-ups emerging into the scene, capturing audiences that are looking for more from their banking experience. Historically, banks have relied mostly on gimmicks and age-old prestige to attract consumers, but that just isn’t cutting the mustard anymore, as customers today have other priorities for their banks, with ‘improving customer retention strategies’ and ‘improving the customer content strategy’ at the top of the list. A study conducted by The Financial Brand revealed that less that one-third (31%) of consumers thought their financial institution knew their needs well. This statistic highlights the clear missing piece for financial brands, as customers seek to invest more than just their money, but their emotions too. Further findings from this study also show that 20% of consumers feel like their bank views them as just a number, with another 28% holding the opinion that banks predominantly have their own interests in mind when conducting business with a consumer. This feeling of misunderstanding and neglect from finance providers only fuels the stereotypical view that banks are clinical, cold and cash-orientated, an opinion that has been conjured by a history of unsentimental and impersonal approaches to consumer finance. In research conducted by CGI, it was found that consumers want personalised services and furthermore, consumers would be willing to switch to non-bank alternatives to seek out these services. How can personalisation help in Consumer Finance? Personalisation has long been embedded into the marketing strategies of industries such as clothing, furniture and holidays, with Deloitte reporting that between 18% and 25% of customers have made personalised purchases in these categories. 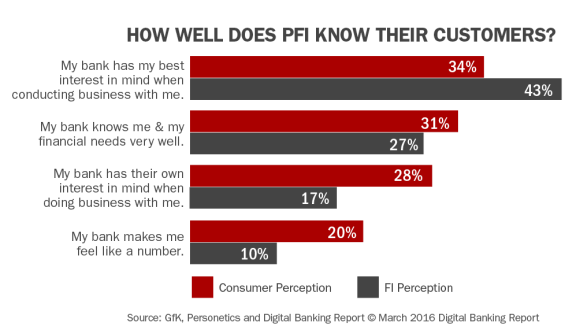 Consumer finance, however, is still lacking on the personalisation front. In a post-crisis financial environment, customers are needing solutions that can satisfy their needs for money management – personally. The demand is certainly there, meaning banks and credit unions are facing a crossroads: acknowledge and respond to the increased demands of a personalised service model, or try and shepherd customers into a dated mass-production model. Setting out solutions that help consumers meet a specific objective or purchase (e.g. a new car, holiday or property). By specifically setting out to help customers achieve a relatable goal, consumer finance brands appear less of a product variety shop, but more of a personalised solution that isn’t just “one size fits all.” The baby-boomer generation (circa. 1946) are nearing the end of their wealth accumulation stage, and a dramatic demographic lies ahead of finance brands. Millennials and Generation Y are slowly gaining more economic power and influence, and will set to completely reshape how businesses are currently serving customers. There are, of course, a number of risks and barriers for consumer finance companies that wish to take the next step into offering mass-personalisation. From a top-level scope, production costs and execution quickly make personalisation a costly matter, particularly if an automated process or system is not available or utilised. There is also the potential of new complexities forming from a customer’s perspective, as offering full-circle, personalised solutions may actually leave some facing uncertainty and “too much” choice when it comes to their finances. Despite these perceived blockades of implementing mass personalisation in consumer finance, a number of leading banks have found success by turning to third-party solutions to make the process considerably less time-consuming and more cost-effective. In the age of ‘big data’, knowing where to start with customers’ needs can be difficult to decipher. Software solutions such as mporium ENGAGE empower businesses to deliver truly unique customer experiences, with the aim to provide a comprehensive profile of each customer individually, to serve the right content in real-time. Creating seamless online experiences that can be influenced by external stimuli and the already existing data on the customer can drastically help improve brand loyalty and trust; the two biggest needs for consumer finance brands. As technology trends continue to advance, more innovative solutions are now needed to truly satisfy customer needs. In industries such as consumer finance, that are typically sterile and act more as a product-shop of services to provide the necessities in money-management, personalisation is desperately required to fulfil the modern customer’s need for trust and loyalty in companies. Properly implemented personalisation can result in a greater feeling of satisfaction and fulfilment from the customer, also broadening the opportunities for consumer finance brands to serve more tailored and concentrated solutions – naturally resulting in an improvement of loyal customers.